This post continues my chronicle of moving to a new apartment in Japan. Last post I thought to check for Internet reviews of my new apartment... after I'd already made the down payment. Fortunately I didn't find any unpleasant surprises online. The real estate agent calls me in: My rental contract has arrived. I stop by in the evening to sign and stamp my inkan on several documents. your eyes tell the real story. This document is required by law to be provided and explained at the time a rental contract is signed. Furthermore, a person with proper certification is required to explain it. The agent you've been working with might not have this certification, but someone at his agency does. That person will sit down with you and explain the details of the contract. They'll confirm the rent you'll be paying, the shikikin and reikin, the address of the building, materials used in construction of the building (including whether tests have been performed to ensure absence of harmful substances like asbestos), whether the property is in a location designated as high-risk for landslides, fires, tsunamis, etc., types and providers of utilities in the building (water, electricity, and LP or Toshi gas), what rights you maintain as a renter if the property is sold to a new owner, what rights the owner maintains when you decide to end the contract (e.g. usually you have to notify the owner of your intent to move at least a month in advance, and there is often a penalty fee if you leave within 6- to 12-months of the contract's start date), under what conditions the owner can kick you out and how much notice he has to provide, whether pets are allowed, what responsibilities you have as to restoration of the apartment to its original condition on contract termination (e.g. fees you'll have to pay for cleaning and to have the lock on the door changed), how long the contract lasts, whether the contract can be renewed and if so, whether that renewal will cost you more money (another example of ridiculous fees in Japan), etc. ad nauseum. This document can include very specific details that might throw you off. One of my past contracts stipulated that I would be penalized at the end of my contract if it was found out that I'd moved any "excessively heavy furniture (including pianos, etc.)" into my apartment. Another said that pets were not allowed (as they aren't in an overwhelming majority of Japanese apartments), but provided specific exceptions for "goldfish and small birds." After the certified agent has gone through every detail on this piece of paper with you and confirmed your understanding, you'll write your name on it and stamp it with the inkan. 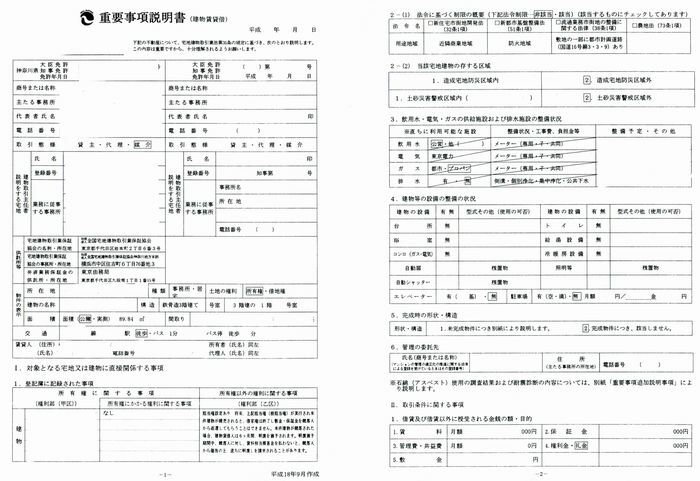 Next up are documents ③ and ④, the explanation of your monthly rent payments and the outstanding balance you have with the agency. We'll take a look at those when we continue the moving adventure next week.